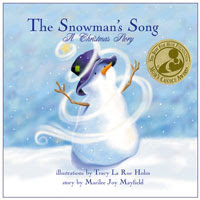 The Snowman's Song is the kind of sweet story that warms you right down to the tips of your toes. A little boy snowman stands silent, listening to the happy songs of Christmas. Full of hope and faith, he desperately wishes he could sing a joyful song, a bright hymn to the Savior's birth. As he begins to despair, a tiny bird and a little girl help him discover his voice one wonderful and miraculous Christmas Eve night. The heartwarming, bluish hued illustrations of the little snowman set the perfect tone for this sugary inspirational story. I read the book to my preschool daughter and for the most part she listened intently, wanting to hear if the snowman gets a chance to sing. The text is rather lengthy and lyrical (probably more suited to early grade school readers) and she briefly lost interest in the first part of the book, but when the little girl dressed in pink entered the story and started playing with the snowman, she quickly regained interest. The book comes with an audio CD of the story set over an angelic children's choir song but the sound quality is slightly tinny sounding. This is probably not a story we will read over and over, but is one we'll revisit once each Christmas season and discover the snowman's unique melody anew. "Goodbye, Mommy ... Here we go! Through the door And ... HELLO, SNOW!" 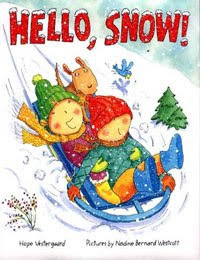 - Hello, Snow! Just as exciting as a romp in the snow, this book was, by far, the favorite read-a-loud in our home this snow-filled week! A little girl bounces out of bed early in the morning, excitedly gets dressed and persuades her daddy to join her outside in the SNOW! Accompanied by an comical cat and dog, the kids build a snowman and speed down a hill on a sled, crashing at the bottom in a humorous heap. Luckily, mom is ready with some yummy hot cocoa with marshmallows. 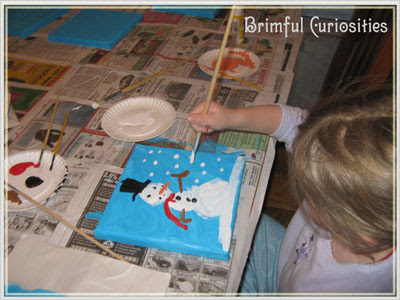 My daughter made several gorgeous, small snowman paintings to give as gifts to close family members. She loved painting with acrylic paint on canvas and felt like a real professional painter. 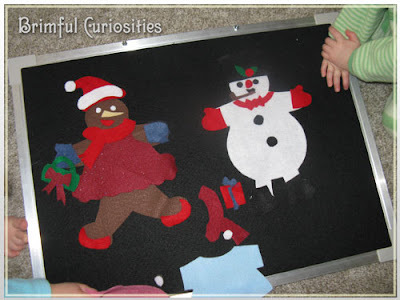 We also made our own felt board snowman and gingerbread man (many thanks to A Mommy's Adventures for the great idea.) The dresses, shoes, mittens, hats and other accessories are all interchangeable and the kids really enjoy dressing their holiday felt characters in fashionable outfits, many that even Frosty himself would love to wear. Oh, I've just returned from the library where we checked out books about. . .snow! This post is very timely for us. Thanks for sharing, and also for sharing the lovely art work. So inspiring! Thanks for joining this week. We read many snow books and snowmen books despite total lack of snow here in Silicon Valley. Your daughter did a great drawing - really lovely. I love the felt set too - how fun.